How to use Separate.Pro to complete your client’s financial disclosures. We instruct your client step by step to give all of their information and documents for Declaration of Disclosure, Income and Expense declaration and schedule of assets and debts. We generate the disclosure forms and all attachments for your review. Follow up with your client when you need to, flag sections, make notes, and change or add information as needed. 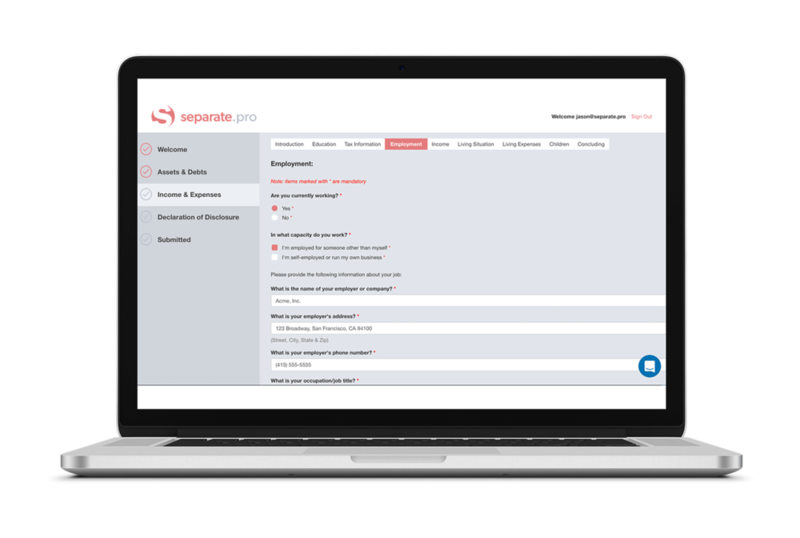 Separate.Pro takes the guesswork out of completing financial disclosure forms. If you or a client gets stuck or has issues, our 24/7 live chat and our knowledgeable staff are ready to help. Using the software and need help? Contact us or start a chat with our tech support, and we’ll be happy to assist. Legalpassage.com, Inc., operating as Separate.Pro, is not an attorney or a law firm.